The comedy community is rallying behind their own and offering support to comedian Caleb Medley and his family. Caleb is a comedian who went to see the Dark Horse Movie in Aurora and was shot. His is in a medically induced coma, has lost his right eye and has some brain damage. His wife gave birth to a baby boy, Hugo yesterday. They have no health insurance and are in need of assistance. 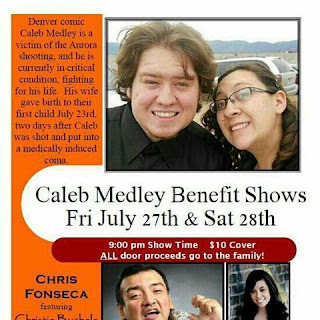 Comedians around the country are holding benefit shows with proceeds for the Medley family. 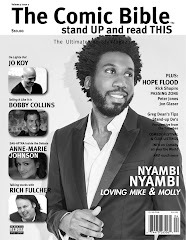 Aug. 4 at The Impossible Playhouse in In Pueblo Co. 8pm showtime all proceeds go to the Medleys. Friday at 8:00pm at OLD CITY COMEDY, St. Augustine, Florida. If you know of a show plese leave a message here and we will post it. Thanks!